Some of the contributions to JUDICIAL ELECTIONS break more ground compared to others. For example, Herbert M. Kritzer examines contestation and competitiveness in state supreme court elections in a manner akin to his recent book, but he brings a new focus to individual states in this work. Others make major additions to their existing research. In one of the most detailed chapters, Larry Aspin not only examines an impressive 7,845 retention elections in state trial, appellate, and supreme courts, but he also includes one of the most exhaustive [*32] analyses to date of opposition campaigns against retention eligible judges. Other chapters present more novel research. For example, Lawrence Baum, Thomas R. Gray, and David E. Klein outline a new method for measuring the policy implications of election outcomes. The contributions of JUDICIAL ELECTIONS are not only original, but also accessible to a general audience. Most chapters include quantitative analysis, but readers won’t need a mastery of statistics to understand them. Consequently, JUDICIAL ELECTIONS will make for an excellent companion to undergraduate courses on subjects like judicial or state politics. And while the book can make for a useful primer in a graduate course such as a pro-seminar in American government, it is not a replacement for the more theoretically and methodologically sophisticated books or journal articles most of its chapters draw upon. Rather, it should be seen as a companion to a larger body of scholarly work. And while it is unlikely that JUDICIAL ELECTIONS will find a lay audience, one hopes its accessible tone will at least help it to break down some of the academic silos that often hinder the interdisciplinary exchange of ideas. Perhaps most important of all, JUDICIAL ELECTIONS is evidence-based. This is crucial because arguments over the popular selection of judges are too often supported by unsubstantiated claims or are rooted in normative theories about what courts should be rather than what they are. Indeed, much of the work political science has devoted to judicial elections in recent years has been motivated by such unsubstantiated claims. Some were eventually supported by scientific evidence while others were not. If JUDICIAL ELECTIONS can be criticized for having blind spots, then, it is largely with respect to the issues political science research suggests the reform advocates might have gotten right. JUDICIAL ELECTIONS takes a panoramic view of its subject matter, but one area that merits greater reflection is how judicial elections affect case outcomes. One of the most serious charges courts reformers level against judicial elections is that justice might not be blind when it runs for office. True, the contributors to JUDICIAL ELECTIONS do not ignore this issue, and citations to other works on this subject are plentiful. But the normative gravity of this question merits, at a minimum, chapter-length consideration. For example, how does decision-making change as judges become more electorally vulnerable or cases more salient? How do political intermediaries like special interest groups or the media affect case outcomes? Or how does the system of checks and balances respond to the presence of elections? These are the types of questions that make judicial elections such an interesting topic of study, given that they place the balancing act between democratic majoritarianism and judicial independence front and center. Because much of the research agenda surrounding judicial elections has been shaped by normative arguments, political science scholarship on these topics has a tendency to be retrospective in the sense that we are still examining today claims made by reform advocates from years past. But what does the future of judicial elections research look like? 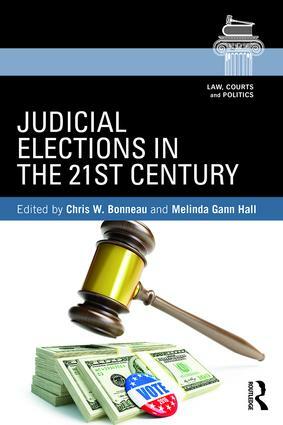 The editors conclude their anthology by encouraging greater investigation into judicial performance evaluation commissions, more research on lower state courts, additional research into digital campaigning along with other forms of political communication, and a greater recognition among scholars that appointive systems of judicial selection can produce the same threats to judicial independence as elections when judges stand for reappointment. Each of these research agendas is important and merit the literature’s attention moving forward. It is not clear that judges really are that different from other elected officials. Judicial review gives individuals discretion to read their values into the law—consciously or unconsciously. As such, they are policy-makers. A growing body of research finds that judges’ lived experiences are pertinent to case outcomes. But scholars understand little about judicial representation in elected courts. Do elected judges have a different role orientation compared to appointed ones? Do voters expect their elected judges to literally represent their preferences, or is descriptive representation an end in its own right? Can elites such as special interest groups intercede and reshape the principal-agent relationship between voter and judge? There is much that still needs to be learned. As we move to address important research questions such as these, individual-level data such as surveys, interviews, and case studies will prove critical to the advancement of the literature, especially where experimental methods can be employed. The collection of these data will likely be expensive and time-consuming. But if the publication of JUDICIAL ELECTIONS IN THE 21ST CENTURY has taught us anything, it is that the discipline is capable of a sea-change in a remarkably short period of time. Streb, Matthew. 2007. RUNNING FOR JUDGE: THE RISING POLITICAL, FINANCIAL AND LEGAL STAKES OF JUDICIAL ELECTIONS. NEW YORK: NYU PRESS. © Copyright 2019 by author, David Hughes.